I am so behind on noticing this, but the Cincinnati Enquirer did an article about great places to eat cold treats this summer and we made the list! I marked our part in bold at the bottom of this article. Feel free to read the whole thing here. Hot summers are made bearable by cold ice cream. The frozen sweetness sliding down your throat and giving your brain a freeze can instantly take the temperature down a few notches. UDF: Graeter’s gets all the attention from the national media, but it’s people who live here who really appreciate UDF. That’s because having UDF in town means that there’s an honest-to-goodness ice cream parlor in just about every neighborhood, where they will make you a turtle sundae, whip up a real milkshake or make an actual ice cream soda – for pretty cheap and with good ice cream. A taste test done with a full panel here at the Enquirer several years ago picked UDF’s chocolate ice cream above many other brands, and I still think it hits exactly the right amount of chocolate richness: darker than milk chocolate, but not as challenging as bittersweet and extra-dark. A torched marshmallow on top of ice cream at Hello Honey, Downtown. 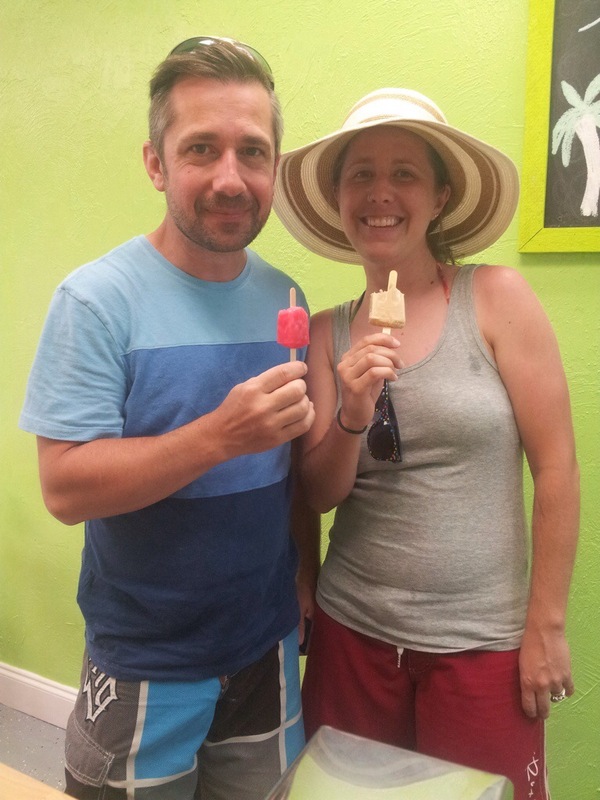 Hello Honey: Brian and Nitima T. Nicely are the owners of this Downtown ice cream store. Nitima makes the ice cream. And the cake. And the marshmallows that she will put on top and then torch with a creme brulee torch. I find the ice cream is sometimes a little grainy, but I love the flavors it comes in, from spicy chocolate to salty caramel and brown butter chip. 633 Vine St., Downtown. 513-977-0300. The Colonel’s Creamery: They do cones, shakes, ice cream cakes, floats, malts and sundaes. A recent list of their flavors included cherry pomegranate habanero, coconut chip, huckleberry, Nutella swirl, yellow cake and Unbridled rum raisin. 10050 Norbotten Drive, Florence, 859-488-1351. Italian ice, or water ice, is a simple frozen mixture of water and sugar and fruit or flavorings. Italian ice, or water ice, is a simple frozen mixture of water and sugar and fruit or flavorings. It’s popular on the East Coast, in particular. ICE ‘N EZ: Transplanted New Jerseyans opened this little spot across from the Mason Public Library. They have a case full of brilliantly colored Italian ices. It was wildly sweet. 115 Reading Road, Mason, 513-336-0062, http://www.icenez.com. Gelato has made it to the mainstream. This is the first summer you can order it at Graeter’s, but there are several small gelaterias who got there first. Gelato is Italian ice cream, but it’s not just the name that’s different. While ice cream has at least 10 percent milk fat, gelato has 5 percent to 7 percent. It’s churned at a lower speed, so it’s denser, with less air whipped into it, and it tends to have more intense flavors. Buona Terra offers gelato on Mount Lookout Square. You can choose a couple of gelato flavors and take them across the street to sit and eat them with your dainty gelato spoon. I could tell the blackberry was made with real berries, seeds and all. The almond flavor seemed a little weak to me, but I enjoyed the delicate pistachio. The shop also makes crepes. 1028 Delta Ave., Mount Lookout, 513-386-9356, http://www.facebook.com/BuonaTerraGelato. Madisono’s is the granddaddy of Cincinnati gelato. It’s mostly sold in pints in stores and in restaurants. Their chocolate orange is delicious, and they make some lovely fruit-flavored sorbettos as well. Dojo Gelato in Findlay Market makes a variety of interesting flavors, including a very popular Vietnamese coffee. And when you “drown” a scoop of their gelato in their top-notch espresso, you get a delicious affogatto (which means drowned). 1801 Race St., Over-the-Rhine, 513-328-9000, http://www.dojogelato.com. Whit’s custard is scooped like ice cream, but it does have a particularly creamy texture. This is a lot like ice cream, but it has egg yolks added, which makes it smoother and denser. It also is made in a machine more like gelato, so it has less air added. Altogether, it adds up to a very rich-tasting and particularly smooth treat. Whit’s: This is a frozen custard store based in Granville, Ohio, with a location in Blue Ash. Their custard is scooped like ice cream, but it does have a particularly creamy texture. They have vanilla, chocolate and a flavor of the month. There are also other flavors in quarts in the freezer. I loved the peanut butter brownie caramel; it felt rich enough to me without turning it into a sundae or a Whitser, their version of a super-thick shake. 9405 Kenwood Road, Blue Ash. 513-791-1147, http://www.whitscustard.com. The frozen custard at Culver’s is softer, served like soft-serve – but much richer. Their chocolate is intense. Culver’s: The drive through Wisconsin features perfect farms with red barns and a Culver’s burger and frozen custard restaurant at every exit. Now there are Culvers in this area, too. The frozen custard here is softer, served like soft-serve – but much richer. Their chocolate is intense. 8554 U.S. 42, Florence, 859-534-0625; 5742 Tylersville Road, Mason, 513-770-4000; 3111 Princeton Road, Fairfield Township, 513-785-7600; culvers.com. The flavors at Streetpops are natural and unusual, from raspberry lemonade to Thai basil lime and Bourbon passionfruit to creamy choices such as key lime pie, mango creamsicle and chocolate sea salt. Streetpops: You will see this cart at many festivals and street fairs. The flavors are natural and unusual, from raspberry lemonade to Thai basil lime and Bourbon passionfruit to creamy choices such as key lime pie, mango creamsicle and chocolate sea salt. 1437 Main St., Over-the-Rhine. 513-446-7505, http://www.streetpops.com. 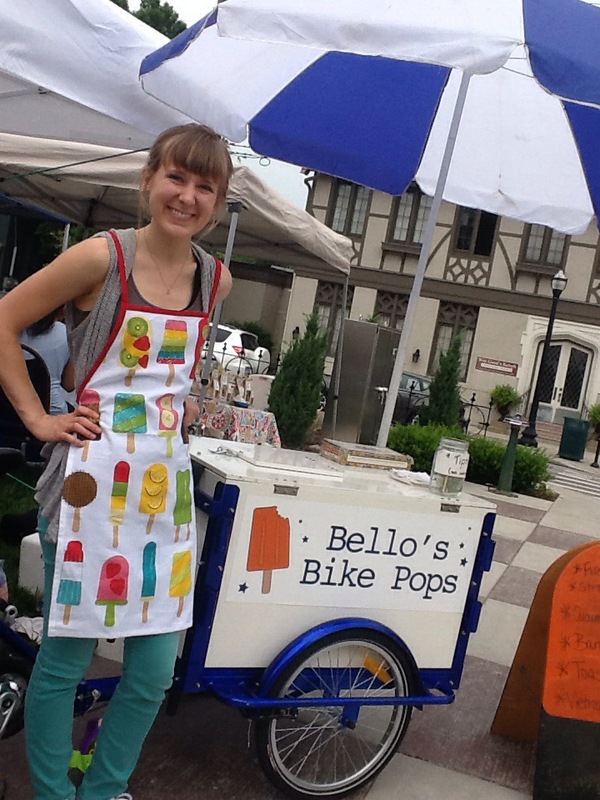 Bellos Bike Pops is another fun popsicle cart with unusual flavors. Their home base is at Carabello Coffee in Newport, open Tuesday-Saturday, but you’ll find the “Icycle Tricyle” at the Anderson farmer’s market, Oakley Fancy Flea, and other events, hawking flavors such as strawberry-mint lemonade, Bananas Foster, hibiscus pomegranate and lavender lemonade. Shaved ice drizzled with flavored syrups is called snow cones, ice balls, snow balls or Hawaiian shaved ice. Schneider’s: Possibly the coldest substance in the world is an ice ball from Schneider’s Sweet Shop: frozen flavored ice poured over homemade ice cream. It’s a summer tradition. Bike pops are doing great and I have been too slow in adding photos of all that has been going on. 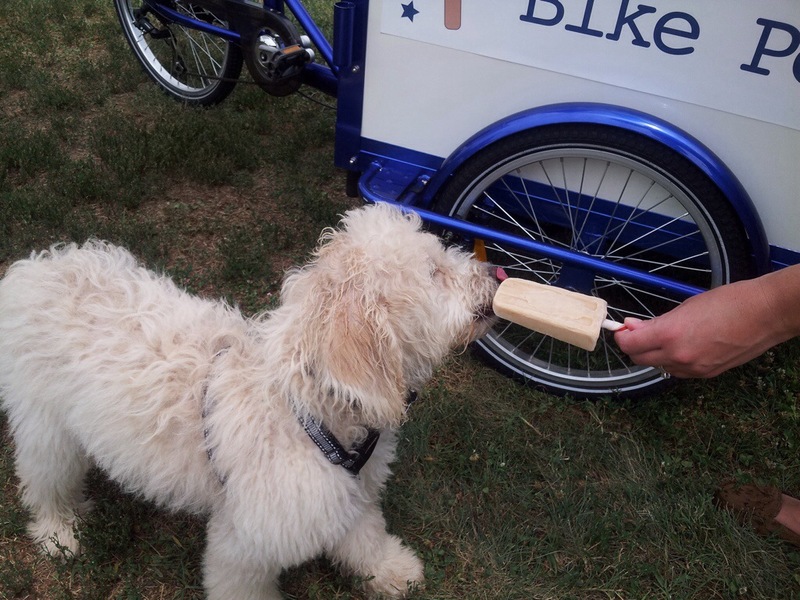 We have had the bike out at the city wide yard sale day, flea markets, weddings and the dog park. New pop flavors are flowing and we are looking forward to some very big events coming up soon. This coming weekend is the Oakley Fancy Flea and the Green Market is close behind. 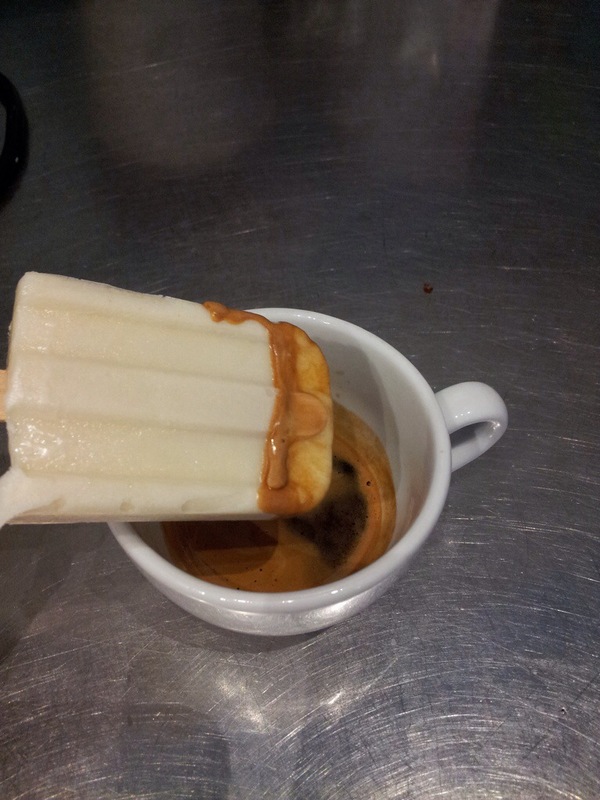 We are experimenting with some pop flavors that taste good with espresso and tentatively calling the “popspresso” more on that later but here is a sneak peak! We had the chance to getaway to Florida for a much needed vacation, and had the opportunity to try three different ice pop companies while we were there. 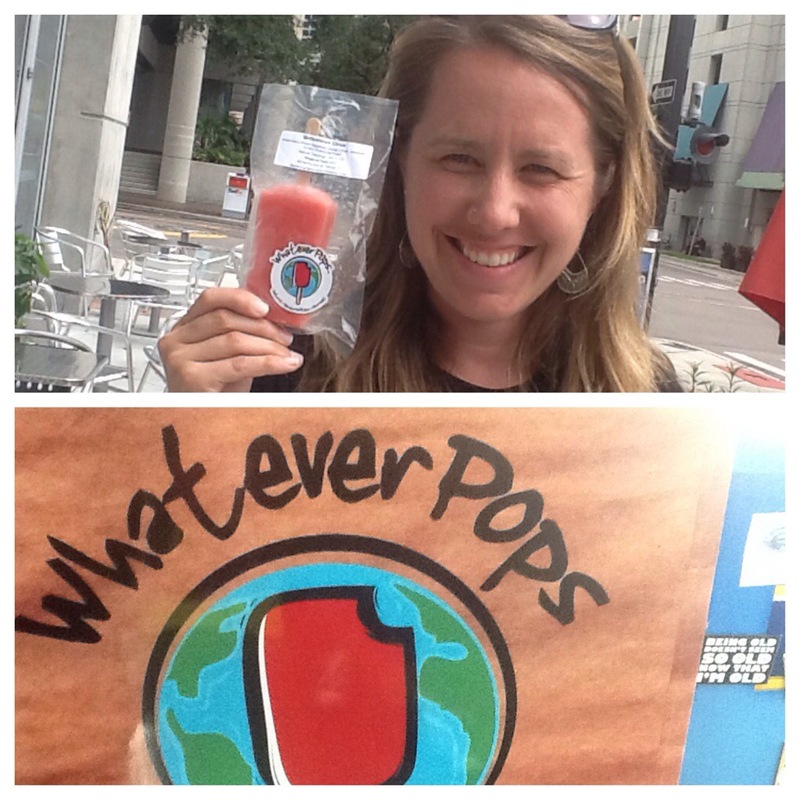 Whatever pops, paradise pops and pop craft pops. It was inspiring and delicious to get new ideas and try other peoples’ creations!